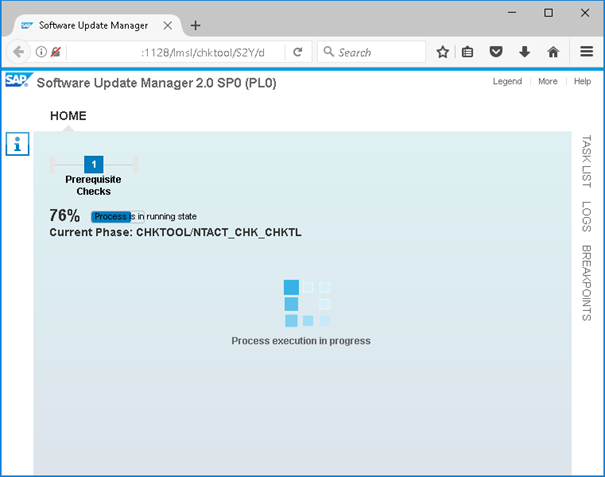 My impression is that the following feature of Software Update Manager (SUM) is not yet well known, although useful for the preparation of a System Conversion from SAP ERP to SAP S/4HANA. You plan for a System Conversion to SAP S/4HANA. Apart from the checks provided by other tools (like Maintenance Planner, SI checks, … see https://blogs.sap.com/2016/11/02/sap-s4hana-system-conversion-at-a-glance/), you want to have a quick check if your source system fulfills the SUM expectations. You use SUM 2.0 as a check tool for a quick and non-invasive check. It allows to see if your source system fulfills the requirements on Source OS version, Source database version, and SPAM patch level. Note that the check option is only available with SUM 2.0, not with SUM 1.0 – only SUM 2.0 is used for a system conversion (see https://blogs.sap.com/2017/08/10/sum-in-the-family-way/). Apart from the usual stuff (source system is running, SUM was extracted and registered at SAP Host Agent), you need the stack.xml for the conversion. Otherwise, the SUM can’t be specific for the target product version. The roadmap is narrowed down to only one roadmap step called Prerequisite Check. The check takes 10 to 15 minutes, and as a result, the CHECKS.TXT log provides the result. See below for example entries in CHECKS.TXT. INFO: Your system was determined as product type "ERP". INFO: A higher version of the operating system is not required. If you plan to upgrade the operating system, do not upgrade it while the S/4HANA conversion of the SAP system is running. If there are any exceptions, you can find them in the operating-system-specific SAP Notes for this S/4HANA conversion. upgrade the database system, do not upgrade it while the S/4HANA conversion of the SAP system is running. If there are any exceptions, you can find them in the database-specific SAP Notes for this S/4HANA conversion. yet collected enough information about the target. So the requested version might eventually be higher. INFO: The upgrade strategy for the addon FI-CA is described in note 632429. Execute the pre-checks as described in *SAP Note 2399707* .